Cabernet Sauvignon by Elderton of Barossa Valley. Full bodied palate exhibiting plum and back fruits, classic Barossa varietal characters of cassis, black olives and mint. 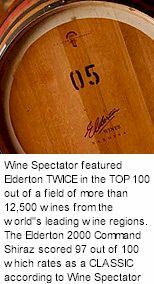 Elderton Cabernet was winner of the prestigious Jimmy Watson Memorial Trophy in 1993, the following years it claimed back to back Gold and Trophy at the Barossa Wine Show. Elderton sits atop very old, deep alluvial soils over limestone, the majority of Cabernet vines which contribute grapes are over fifty years of age, the oldest established in 1949. Medium bodied, a rich, classy palate, for a fully integrated Cabernet wine showing unobtrusive oak and polished tannins. The inaugural 1982 vintage is now considered a collector's item. The first Command Shiraz followed suit in 1984 making it one of Australia's oldest blockbuster wines. Elderton went on to be distinguished by Australia's most coveted wine award the Jimmy Watson Memorial Trophy (1993) and the prestigious London International Wine & Spirit Competition's World's Best Shiraz Trophy (2000). In 2003 Elderton finished building its own winery in Nuriootpa, formerly a Penfolds site. Elderton was now able to grow, produce and bottle wines all on the family estate. This means a greater to attention to detail. The vineyard now comprises 70 acres with the principle varieties being Shiraz, Cabernet Sauvignon and Merlot. The majority of the vineyard is between 40 and 100 years in age. This age, combined with minimal irrigation, produces rich, concentrated fruit for exhibiting classic varietal characters. The majority of the vineyard is planted east to west, allowing the breezes from the Barossa ranges to flow through the rows rather than across them. These breezes assist with canopy management. The real strength behind the Elderton success is the ancient 72 acre Barossa Floor Vineyard, which produces fruit of the highest quality year in year out. Each block on the property is cherished but the two standouts are the 104-year-old Command Shiraz block and the 64-year-old Ashmead Cabernet Sauvignon block. Some of the older blocks on the vineyard are planted with unknown clones, however, all plantings since 1949 are Shiraz 1654, BVRC12 or BVRC30, with the Cabernet Sauvignon being G9V3 or LC10. The trellising used throughout the vineyard for recent plantings is simply a double wire vertical with single wire trellising used on earlier plantings. Following fast on the heels of the estate's world renown reputation for red wines, Elderton is gaining a reputation for white wines. The white grapes are mostly all picked in the cool of the night to ensure that they come into the winery at the right temperature. They are crushed at this temperature, where some whole bunch pressing is also done and only the free run juice is used, which in most instances is fermented at cool fermentation (14–16°C) levels. The red grapes are also picked in the cool of the night, much of the old vine stock is hand picked to ensure the longevity of the vines and integrity of the fruit. They are crushed and fermented in open concrete, static stainless steel fermenters, or limited amounts of barrel fermentation. These ferments are temperature controlled (normally 20–24˚C) before they are fermented to dryness. The wines are then pressed off in the air bag presses releasing most of the colour and complex tannin structures before being blended back into the total blend. The wines are then pumped over to temperature controlled maturation cellars and carefully monitored before further blending and bottling. The best French and American oak and all barrels are benchmarked annually by the winemaking team and the respective coopers to ensure that the oak complements the wines fully. Stainless steel crushers, centrifuge, air bag presses and temperature controlled stainless steel static fermenters complement the already existing 60 year concrete open fermenters that help shape the wines of distinction. The site also now has a modern lab with a full time lab manager assessing where the wines are at any stage of the process. In 2006, Elderton gained organic certification as a wine processor from the Australian Certified Organic organisation, the first step in the process of working towards a changeover to biodynamic farming techniques.